An employee platform and on-boarding process for virtual college admissions counselors. SeekU is a company that facilitates college admission counseling through on-demand virtual coaching sessions with high school students and SeekU counselors or “Coaches.” They are focused on helping students develop self-understanding and a sense of purpose necessary to do well in the admissions process and beyond. 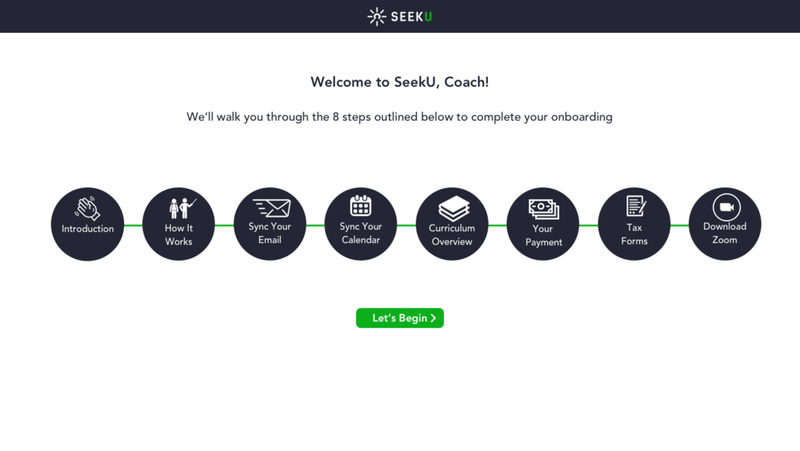 Our UX design team was brought on to create a platform for SeekU Coaches that would streamline their workflow so that they can devote their full attention to their students. We began our research by interviewing SeekU Coaches to develop an understanding of who they are and how they work with students. In order to visualize the coaches main frustrations while conducting sessions and orienting themselves as new hires, I created a journey map for new Coaches and laid out a work flow for experienced Coaches. Above is a visual representation of the current journey a new SeekU coach embarks upon from accepting the role as a coach, to working with their first student. Overall, there is a perceived sense of confusion immediately after the person is established as a Coach. Above is the current journey an experienced SeekU coach embarks upon from the student booking the session to the session completion. The key things to note are the amount of tools (and thus screens) the Coach needs to open and navigate throughout the session. Some of these tools are ones provided by SeekU but we found that Coaches also use their own methods of keeping track of their students. We aimed to streamline the 4th and 6th steps shown above so that the coach can focus on giving the student their fullest attention. Armed with our research, we conducted design studio sessions to start visualizing solutions to the key problems we identified in our research. A Coach dashboard that would unify the essential functions of the third-party apps currently used as one seamless experience. As we moved into medium and high fidelity wireframes we continued to test our designs on the SeekU Coaches and made adjustments accordingly. I led the content prioritization and design for the on-boarding process. I originally identified 6 steps, but found through usability testing found that more steps were needed to fulfill the administrative set up and give the coaches all of the tools they need to work with students. Once the content was finalized, I played with different ways the overview step might look in high fidelity. We tried with different versions of the dashboard from customizable widgets to a more straightforward calendar and to-do list version. Through our testing we found that coaches were mainly concerned with their SeekU schedule and how it fit into their personal schedule. We finally arrived at a calendar version that had the option to filter by all events (personal + SeekU) or just SeekU events as well as by week, month and year. Our final product was an informative experience that took the Coach through the SeekU world from on-boarding to coaching.